Description: Ptolemaic woodcut map of Iran (Persia) from the 1541 edition of Ptolemy's "Geographia" with maps by Laurent Fries, text by Michael Servetus, and published by Gaspar Treschel. 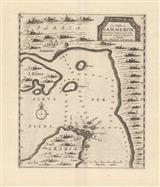 Description: Early miniature map with cartouche and later hand colouring. Description: Early copper-engraved map of the Persian Empire, covering the Caspian Sea, Iran, northwestern Arabia, Afghanistan and Pakistan. German test on verso. Strong impression. Description: Persia. Miniature map of the region. Coloured. Description: The Persian Empire. An attractive miniature map charting Iran, Pakistan, and Afghanistan. Coloured. 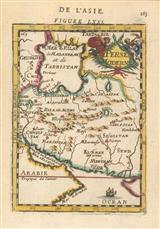 Description: Early map of Iran, with parts of surrounding Afghanistan, Pakistan, Azerbaijan, Arabia and Iraq. Published as part of "Hakluytus Posthomous" or "Purchas his Pilgrimis". Coloured. Description: The Persian Empire from its western borders near the Caucasus stretching almost to the River Indus in the East. Original hand-colour. Description: Persia. Stunning map with illustrated borders showing cities and inhabitants. Coloured. Description: Early miniature map of Iran, with parts of Afghanistan, Azerbaijan, Arabia and Pakistan. Coloured. Description: Miniature map of Iran, with parts of Afghanistan, Pakistan, Iraq, Azerbaijan and Arabia, with descriptive English text below and verso. Coloured. 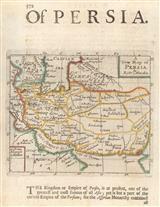 Description: A miniature coloured map of Persia. Description: Attractive 17th-century map of the Persian Empire by the founders of French map-making. Dutch F. Halma edition. Vivid original hand-colour. Description: Straits of Hormuz. Modern day Bandas Abbas. Beautifully engraved map with elaborate cartouche. Strong impression. Description: The Persian Empire including a large part of the Caucasus in the west and Beluchistan in the East. Original-hand colour. Description: Visually stunning map with rich original colour. Surrounded by two large intricate cartouches showing the Persian Emperor surrounded by allegorical figures and a coastal scene. Description: Early copper-engraved bird's eye view of the city of Ardabil, northwestern Iran. Original hand colour.